The month of March is the month of “light” for western Alaska. All of a sudden, it seems, the darkness of winter is overcome by hours of brilliant sun. Possibly because of the dramatically increased light, March was once known as “suicide month.” It’s a time when we put an extra effort into our programming, knowing that we are a comfort to many troubled people. Please keep all of them, and us, in your prayers, won’t you? And thank you for making our work possible. ANGEL: Please pat yourself on the back once again, as KNOM has won an Angel Award! We accepted the honor for us at the Roosevelt Hotel in Hollywood. Excellence in Media presented our mission the Angel to recognize KNOM’s “Eskimo Stories and Legends” program, produced by volunteer Mike Nurse. Especially mentioned was one episode, “Sea Serpent,” which was voiced by Florence Busch. The organization created the accolade to honor “the best in moral and social impact” among radio and TV. Once again, we’re in heady company. Other Angels were given ABC News, Dateline NBC, Lifetime Television, WNET Washington, DC, WPIX-TV New York, the Sacred Heart Program, St. Anthony Messenger Press and WPBT-TV Miami, FL. We share this honor with you, for it is you who makes KNOM’s powerful signal possible. Thank you again for your support and your prayers. HOT DOGS: In the third week of March, Nome will be packed with Iditarod dogs. Former KNOM volunteer Jodi Engle is flying the entire 1,000-mile trail by small plane, interviewing mushers, while the KNOM crew are producing race updates every hour. If you could see these canine athletes first hand, you would note how healthy they are, and how happy they are to race. Later this month, as dog teams trickle into Nome around the clock, we will broadcast every arrival live. You can imagine how “dog-tired” everyone on the staff will be! since 1971 -- thanks to you. INSPIRATIONAL SPOT: The uncertainty of our future is really an asset, not a liability. Whenever we are uncertain about something, we’re more open to new ideas. Have you ever known an explorer who was sure about what would be discovered? Uncertainty allows us to follow God’s lead to new perspectives, new ideas, new directions. INSPIRATIONAL SPOT: If care is too small to be turned into a prayer, it is too small to be made into a burden. 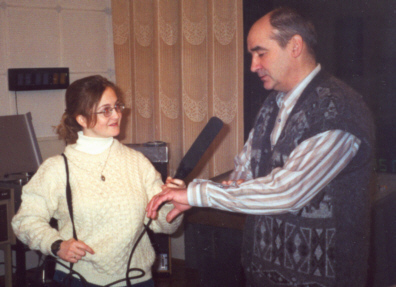 (Left) Victoria interviews Yuri Fedorov, the chief engineer for Anadyr’s local radio station. In January, KNOM volunteer Victoria flew in a 9-seat Piper Navajo, across the Bering Sea to Anadyr (ah-NAH-deer), Russia to cover the inauguration of the region’s new governor. With 12,000 residents, Anadyr is the closest town of that size to Nome. 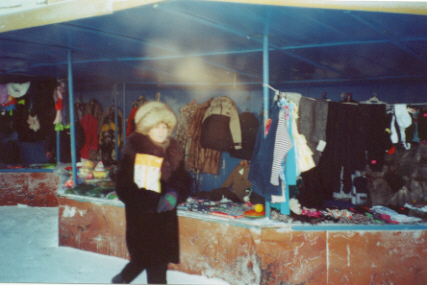 When I learned I was traveling to Russia my mind raced with a million thoughts. What is life like there? How do Russians feel about Americans? And, of course, what is the weather going to be like? 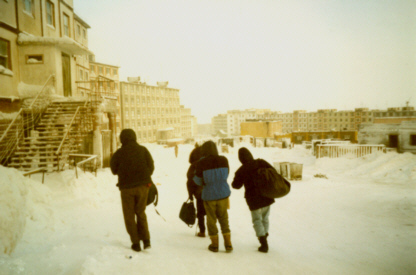 (Left) An Anadyr back street, with the town’s heating plant in the distance. The entire region of Russia near Alaska is known as Chukotka (choo-KOTE-kuh). It’s a tough place, isolated, with a harsh climate. It’s faced with poverty, loss of electricity and heat, crumbling buildings and food shortages. On landing, our visas and passports were checked by Russian military. The wind chill was minus seventy degrees! I was met by the group’s interpreter, a friendly woman named Natalia Feokstistova (left), to whose flat I’d been assigned for the two-night stay. 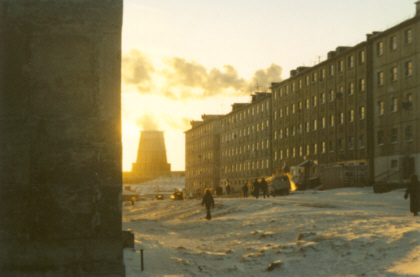 There are no private homes in Anadyr, only large, box-like concrete apartment buildings. Most of the paint was chipped away and parts of her building’s exterior had fallen off, but inside, Natalia’s apartment was clean and neat and decorated carefully. During my brief stay, I recorded so many interviews with Russian people that some of them are appearing on the air in March! 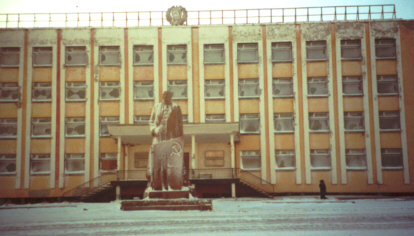 (Left) Lenin may be gone from many places in Russia, but he still reigns over the public square in Anadyr. All of the Russians I met were friendly and hospitable. Many of them told me about the struggles of the past few years, and their hopes for a brighter future for themselves and their children. For people in Anadyr, life is pretty much reduced to the basics. But they are cultured people. Despite their poverty, they dress formally, women in dresses and always carefully made up. 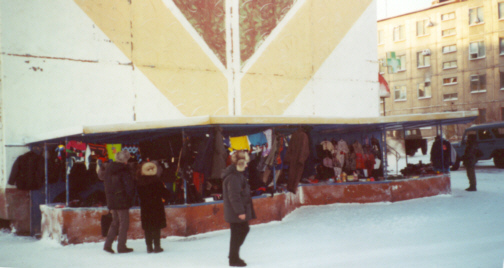 (Left): One of the few stores in Anadyr is this open-air clothing store. In seventy below zero wind chills! They didn’t have much, but they treated us like royalty, serving great meals of pasta and fish. They’re like Italians! There was very little fresh food, even less than we see in Nome. Natalia teaches English in high school. Her salary averages $70 a month. Competition for college is so keen that she says, parents help their children to cheat in order to raise their grades. 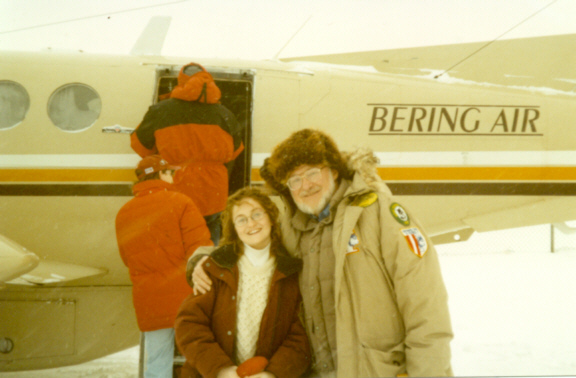 (Left) Victoria shares a hug with Nome mayor Leo Rasmussen, as they board the small plane home. Anadyr is supposed to be the richest town in its entire region. Still, a lot of buildings were unoccupied, all of their glass broken. Most of the streets are not cleared of snow, but that doesn’t pose a problem as there are only a few cars, all of them owned by high government officials. In winter, school is often canceled due to cold. There’s an orphanage with dozens of kids. 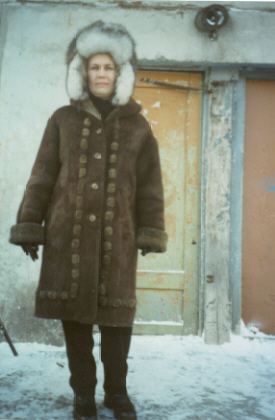 I was told that in Chukotka’s Eskimo villages, things are far, far worse. Many of these places have completely lost electricity and heat. But they still have their spirit. We enjoyed much laughter together, evenings filled with spirited storytelling. I made many friends over there, and I keep them in my prayers every day. 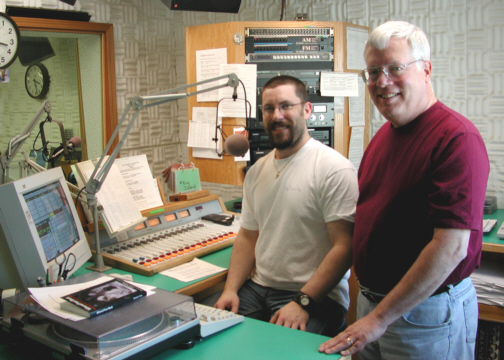 KNOM volunteer Mike Nurse instructs his dad Howard in master control Studio A.
Howard flew to Nome from Healdsburg, CA for three weeks to help the KNOM staff during the hectic Iditarod Race. Howard kept us updated on the race progress and did his share of on-the-air work, too. INSPIRATIONAL SPOT: It’s good to be a Christian and know it, but it’s better to be a Christian and show it! top KIDS BEHIND BARS: It’s been a couple of years since we’ve “blitzed” an important group of issues. In early March, we broadcast a long series of interviews, call-in programs and news stories about the heartbreaking problem of juvenile crime in western Alaska. Despite our small population, over 400 kids are currently under the wings of Alaska’s juvenile system. Many of them are the products of violent homes, or the ready availability of alcohol. Before our broadcasts this month, few people here recognized the severity of the problem, and the lack of decent facilities which local youth counselors and probation officers think are needed to help prevent children from getting into trouble in the first place. We thank the many individuals who participated over the air, from a 17-year-old who’s living in detention, to Ben Esh, Nome’s Superior Court judge. And thank you for your help that funds important broadcasts like these. CAPITAL IDEA: In February, the Alaska Broadcasters Association sent Ric Schmidt to Alaska’s capital to lobby legislators on broadcast issues. From Nome, Juneau is 1,097 miles. That’s more than the distance from New York City to Omaha, Nebraska! Once more, thank you from the bottom of our hearts. Your financial support and your prayers are what make our much-needed mission alive and successful in this far-flung region. Your friendship means more to us than we can express. We promise to continue keeping you and those you love in our prayers. May God greatly bless you, now and into the future. INSPIRATIONAL SPOT: The heart is the happiest when it beats for others.